While standing in line at Walmart tonight a 3-pack of Kellogg's Frosted Flakes caught my eye. I had just bought a box for $2.98 at Target a couple of nights before, and this 3-pack was only $5! 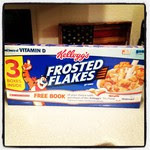 I grabbed it because I was convinced this was the deal of a lifetime on Frosted Flakes! Imagine my surprise when I saw on the packaging that when I purchased this 3-pack I also received $5 in free books from Scholastic! I thought I would have to jump through hoops to get the free books, but all I had to do was register for the Kellogg's Family Rewards program, enter the code from the inside of the packaging and voila! There was an email waiting for me with my $5 coupon for Scholastic! So, if you're at Walmart this week, see if you can find this deal!